The name of this fragrance always put me off. Understanding it to mean “Gates of Hell” I imagined Passage d’Enfer to be sulphurous and indolic. However that couldn’t be further from the truth. Released in 1999, it contains notes of white lily, frankincense, aloe wood, benzoin and white musk. Being an Olivia Giacobetti creation, Passage d’Enfer was never going to be overwhelming. Far from it: it’s quiet and meditative. Its hushed tone seems to suit its spiritual home of a medieval church. 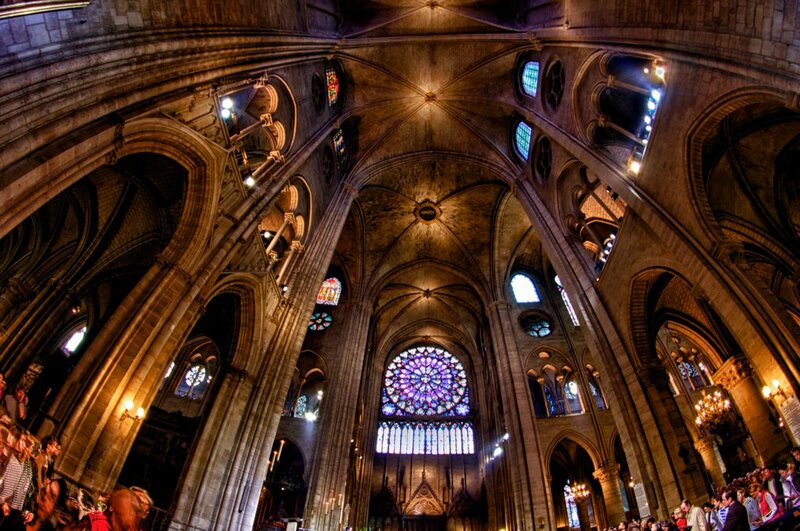 It reminds me of the Notre Dame in Paris which I visited on my 18th birthday. Like that very special cathedral, Passage d’Enfer has a holy atmosphere which verges on the mystical. I don’t find anything hellish about it, but there is a dark shadow lurking behind the gothic pillars. The mood is contemplative, mysterious and otherworldly. I find it beguiling. For me, Passage d’Enfer only suggests the presence of lily. There are hints of the soft waxy feel of the petals, the luminous white colour and the prettiness of the flower. But when I breathe it in, I don’t think “lily”. It’s very subtle and not at all indolic or high-pitched. I suffer from white flower fear, but there isn’t the slightest danger of it being headache-inducing. The incense in Passage d’Enfer is soft and more woody than resinous. It’s the scent of a stick of incense that has recently been snuffed out, leaving its smoky tendrils spiralling up towards the vaulted ceiling. Serge Lutens played a not dissimilar game of light and shade recently. His L’Orpheline combined dark incense with soapy aldehydes but I find Passage d’Enfer much more feminine and intriguing. 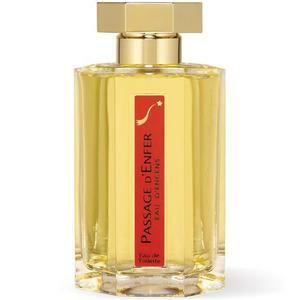 When I spray Passage d’Enfer, I don’t feel like I’m wearing something obvious. I enjoy contradictions, so a fragrance which is ashy and clean, earthbound and ethereal, makes me happy. It’s a clever, minimalist composition which is intellectual as well as soulful. It’s so gentle I highly recommend it to those who have struggled with incense perfumes in the past. It’s a muted, airy scent which you can apply with a heavy hand to get more volume. Despite the lack of projection, I love the contrast between the musty stone of the church walls and the crisp freshness of the calla lilies on the altar. There are also hints of the wooden pews and dripping beeswax candles. There’s a sacred atmosphere but it’s more complex than that. It’s dusk and the light filtering through the stained glass windows is fading fast. A woman offers up a desperate prayer to save her soul from temptation. If anyone gets close enough to smell her, they’ll be left wondering. Yes, they will get holy incense with hints of innocent flowers, but they will also sense something less pure: a quietly burning desire. Chaste in body yet wanton in mind. Perhaps Passage d’Enfer is not such a misnomer after all. This entry was posted in By Tara, Fragrance Reviews, L'Artisan Parfumeur and tagged Fragrance, L'Artisan Parfumeur, Perfume, Review. Bookmark the permalink. True that this really beautiful and almost discreet fragrance when you look at the notes. It really could have been a diabolic perfume. I believe the name comes from a street in Paris called Passage d’Enfer, though I’m not sure if they used to have shop/ HQ there, or why the name… I always remember this because in Lübeck they have the same ‘Fegefeuer’, a small street leading up to the part of the Cathedral called ‘Paradies’. What a pain about your messed up order! I’ll send you some in your next package. I’m sure some people would prefer it to be diabolic but I love it just as it is. “Beautiful and almost discreet fragrance” is right. Thanks for the info about the origin of the name. That rings a bell, now you mention it. You’re right, Asali. L’Artisan Parfumeur HQ used to be at Passage d’enfer road, in the 14th district of Paris. It was one of the first incense perfumes created in France. I really love it, as I find it dry and very « ecclesiastic ». But it doesn’t last long on my skin, like most Giacometti’s creations. I find it quite similar to the Comme des Garçons incense serie, but don’t remember which one. Many thanks for the confirmation Emmanuelle. Giacobetti’s creations aren’t usually very long-lasting it’s true, but often they’re so beautiful it can be worth putting up with. Asali beat me to quoting that very same line from your haunting review! I had a decant of this and gave it to my friend Gillie with a bunch of other incense perfumes, more because my wish to bring her into the fragrant fold was greater than my own need to keep it. I have missed it mind, and your review may trigger a polite inquiry about its whereabouts. 😉 I agree that there is this interplay between innocence and desire in this scent, so in the light of your closing comment, one could recast the well known proverb as ‘the road to hell is paved with wanton thoughts’, hehe. Thanks, V. I love your recasting of the proverb! Don’t worry about Gillie. I’ll replace your decant from my bottle. I wore this last night, the cold and snow have caused me to overdose on resins a bit this winter and Passage d’Enfer is a good palette cleanser. March from the earlier days of Perfume Posse called Pd’E “an all purpose fragrance enhancer” and it’s true, I layer it with lots of things. Beautiful review, Tara, thanks! Thank you ringthing! I’m wearing it to work today in the cold and it’s perfect. Which resin fragrances have you been overdosing on? I had no idea about PdE’s special layering abilities so I appreciate the tip. Les Nereides Imperial Opoponax and Patchouli Antique are two favorite winter perfumes that I enjoy separately or together. They are both rich and delicious! My favorite Passage d’Enfer layering partner is Un Jardin Sur le Nil, seems to bring out my favorite parts of each. Thanks very much for indulging my curiosity ringthing. “Rich and delicious” is perfect in the depths of winter. That layering combination sounds perfect. I’m going to use Passage d’Enfer to amp up the incense in Seville a l’Aube. I’m glad I’m not the only one who was foolishly put off by the name! Your’e probably right that this is unlikely to work for you but well worth a try sometime. Tara, your review is exquisite and moving, which is how I find Passage d’Enfer. I quite agree with you that it is an ethereal and delicate incense perfume that might appeal to those who have struggled to appreciate incense notes – and yes, the lily note is just an accent, so no fears for white-floral haters either. I think this is one of Olivia Giacobetti’s most beautiful scents, and you conveyed that in words so perfectly. I’m so happy that you enjoyed the review and agree with its sentiments. Passage d’Enfer did not make it through my last cull. Though everything you say about it is correct (great review as always, you have a keen sense of the magic of fragrance) it was just too soft for me. It now is in a home where it is much more cherished, loved and worn. To be honest I didn’t remember it had gone and went looking for a spritz before I read your post, love the poor girl at the alter praying for strength especially. Part of me hopes that she does not in fact find the strength and goes out and really lives her life full throttle. Yes, its softness is much more my style than yours but I’m glad your bottle found a happy home. Sandra, I am really hopeful that Passage d’Enfer could be the incense for you. It’s very soft and airy. I must try La Myrrhe one day. I can imagine it’s great in the cold. Not every brand is going to appeal, for whatever reason. I’m surprised you’re not much of incense fan though. I hope I get to experience La Myrrhe on you when I come to Austria. Very beautifully written. I like this one as well – I much prefer a more subtle and less obvious incense. That’s a great compliment coming from you Neil. Nice to hear you are a fan of Passage d’Enfer too. Thanks Tara for reminding us about PdE. Last spring I was looking for my perfect incense fragrance. I found Avignon and his brothers too harsh to my nose and ended up with samples of PdE and Messe de Minuit. I couldn’t use them in summer and they were left forgotten in my sample box. Your review is a good reason for me to come back to both of them. Interesting what will be my impression now? I’m glad my review acted as a useful reminder Polinia. Summer is not the best time for testing incense frags but you picked samples of two great ones so I’m hopeful your impressions will be favourable now the weather has cooled. Of the Comme des Garcons incense series, Avignon was too powerful for me but I liked Kyoto a lot. Tara, it’s such a poetic review for perfume about which I didn’t even know. Since L’Artisan isn’t “my brand”, I tried just a limited number of their perfumes and never felt like I was missing on something. Passage d’Enfer doesn’t have any negative connotations for me: I rather think of a very powerful sculpture of Rodin Première porte de l’enfer I saw at the Stanford University park. Of course now I want to try it. That is a powerful sculpture, thanks for mentioning it. Interesting to hear L’Artisan is a brand you’ve rather dismissed as not for you. I’ve done that plenty of times with other lines, but now own 5 L’Artisan bottles so it’s definitely a brand that works for me. Let me know next time your mule is in London. I ended up selling this one but I find myself thinking about it from time to time. Do I need this if I have the Comme incenses? I’m not so sure but like much of Giacobetti’s work it’s fantastic and sorely underrated. Personally I doubt you need both. Once i got this I swapped away my bottle of Kyoto. Giacobetti’s work is wonderful. Now I’ve fallen head over heels for Hiris, I feel that way even more. I didn’t notice the L’Orpheline and Passage d’Enfer similarity until you mentioned it, Tara. You’re right, both definitely display a sense of dark and light contrast. Now I’m off to revisit my sample of the L’Artisan. Nice to hear you recognise the light/dark contrast in Passage d’Enfer Thomas. I love a fragrance with a dichotomy and incense perfumes are so often in one vein only. Yep. They really can be a bit one note. Passage d’Enfer is wonderfully multi-faceted. What a stunningly beautiful review! I just bought this fragrance today and your review helps me to enjoy it all the more.